Lauren and I entered this expecting the absolute worst. I'm pretty sure she was kicking and screaming and bracing her feet like a wishbone against the door-jam as I dragged her rigidly protesting body inside. If only because our expectations were low, we were pleasantly surprised. Yes, yes, it's extraordinarily hammy. OMG. Don't get me started. It's so completely over the top. The scene featuring Jennifer Garner—the most cringeworthy in a sea of cringeworthiness—is a phenomenal reminder of how far someone can get on a smile. Kate Hudson's parents, portrayed here by Chris Pine's father (Robert, of CHiPS fame) and Margo Martindale, are insufferable. Julia Roberts and Hector Elizondo have some insidery fun at the expense of Pretty Woman, yet Lauren and I could never quite arrive at a satisfying explanation for Julia's abominable hairdo. There's a funny outtake at the end which, coming as it does at Timothy Olyphant's expense, seems, a-hem, Justified. His performance is ninety minutes of mimicking Clint Eastwood and Clark Gable: lotsa swagger, little emotion, and all eye-squint. The women swoon, onscreen and off, so apparently he made days. Lauren tells me "Tina" is played by a girl from Pretty Little Liars, which about sums up the high-bar here for casting, including Britt Robertson, whom you may recall was equally overcast in both The Longest Ride and Tomorrowland, the latter being where she does that remarkable job picking up a park pin and acting out of this world amid a cornfield. 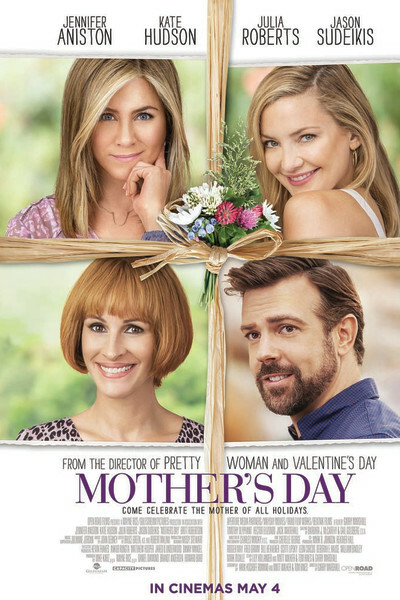 Jason Sudeikis armed his way into this one as well, but the show pony, of course, is Jennifer Aniston, who does her darndest to carry these lumpy potatoes across some imaginary finish line just beyond the horizon. Garry Marshall, who has been part of virtually 1,000 creations since first appearing on Jack Paar in 1960, helms the monstrosity. In spite of these seemingly untangleable Gordian knots, Mother's Day Houdinis its way out and—magically, miraculously, shockingly—turns its table on you, leaving one trapped in its gooey center like a fly on flypaper. Odds are against it, but somehow—inscrutably, inexplicably—perhaps as you did in Miracles from Heaven, one may find him or herself actually feeling benevolent toward Mother's Day and pleased to be seeing it. There is virtually no logical reason why. Some of the acting is borderline atrocious, amateur hour, and many times you'll simply feel put upon by one contrivance or another. The characters are wildly exaggerated stereotypes, and the ending (which is easily forty minutes long) approaches from so far away—like an oncoming train originally the size of an atom—but come it does, on and on and on and on, millions of pounds of potatoes aboard, and there's a chance you'll actually enjoy its lumbering approach. Yep, you'll wince and twitch and sputter and groan, but there are intermittent stretches during which you'll howl and roar and think aloud, "Did he just say that?" Yes. Yes he did. And so did she. And gosh, was it funny.